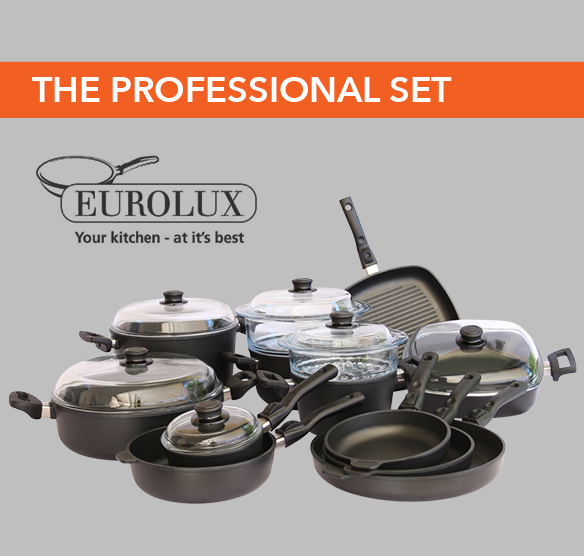 The ultimate collection of premium Eurolux Cookware! Ergonomically-formed handles and lid knobs oven-safe up to 260 C.
Hand-cast base with 4-stage titanium micro-ceramic surface. Food and Safety tested quality by TUEV Rhineland & LGA. 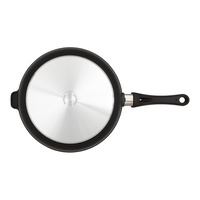 Energy-saving, see-through cooking with premium glass lid. Easy cleaning and versatile use. 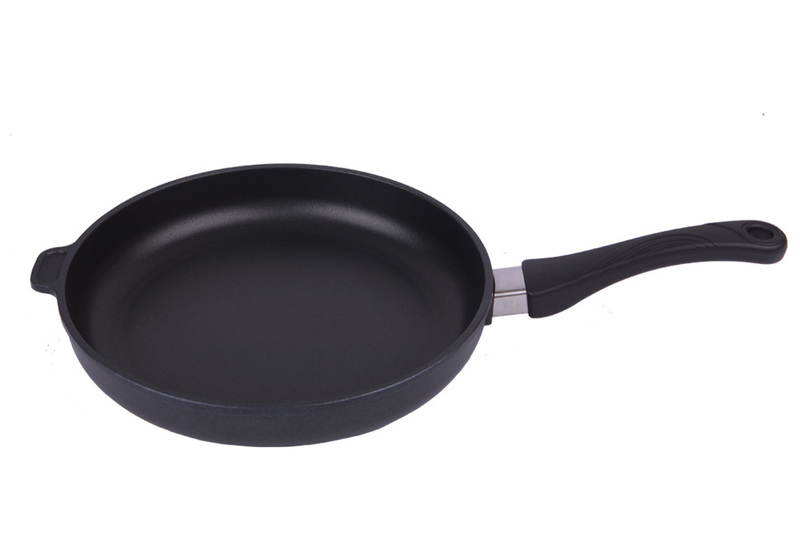 All products in the EUROLUX® range are MADE IN GERMANY using a high-tech titanium ceramic non-stick surface with Micro Ceramic® technology along with the proven, hand-cast permanent mould process. Using only high-quality alloy from German foundries, the 8-9mm base is guaranteed not to warp, even after years of use. The elaborate production process allows the cookware to heat up quickly, with optimal energy efficiency and excellent heat storage. Thus reducing your energy bills while enabling you to slow-cook or roast the most delicious meals ever. 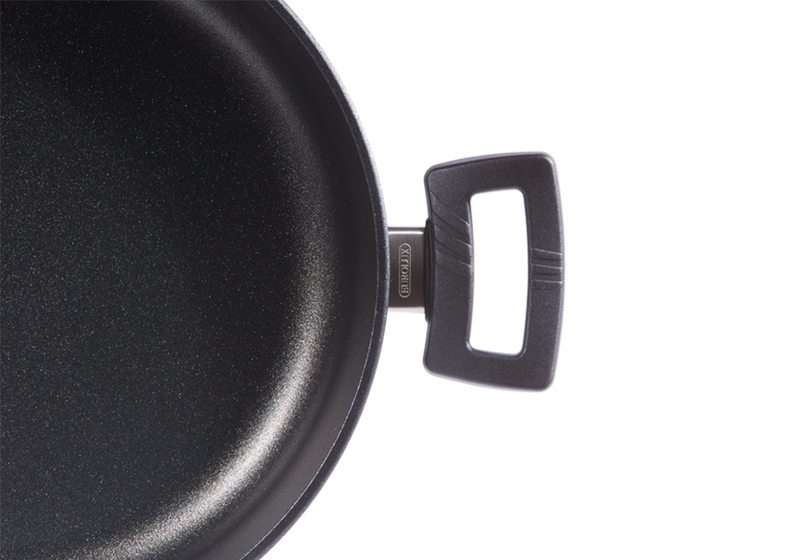 Considering the health benefits, safety, durability and eco-friendly manufacturing, Eurolux is leading the way in how quality cookware should be made. 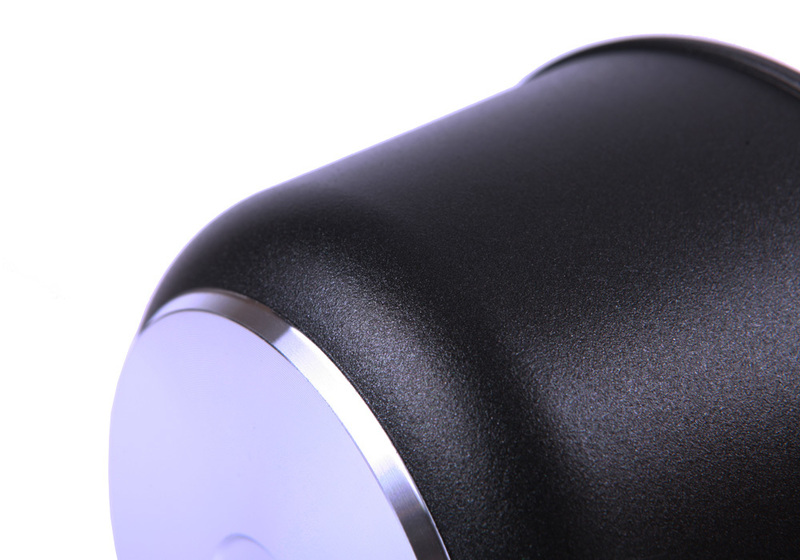 Designer handle, grip, and cover handle, oven-resistant (260 deg C). Awareded with the LGA quality, health and safety approval. Energy saving, see-through cooking with the heat resistant hardened cover made of glass. 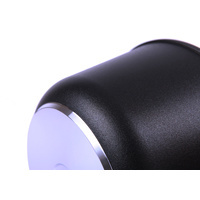 7-8 mm energy saving thermo base. Reinforced pouring rim with opposing handle. 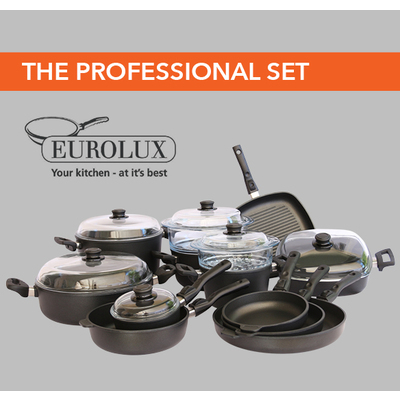 All products from the Eurolux Exclusive series are made of a high-quality alloy hand cast . Made in a German smeltery. 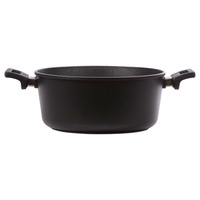 Hand cast is the best possible option to create energy efficient and non distorting cookware. Eurolux has a 7-8 mm thick base, finely turned on a lathe. Warping of the Thermobasic base is not possible, even after years of use. Sophisticated manufacturing. facilitates quick heating with optimal energy use, the best heat storage and uniform heat distribution. 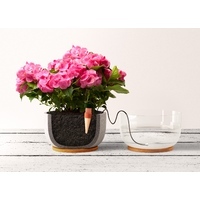 The hand cast base is suitable for all cooktops, including glass and induction*. 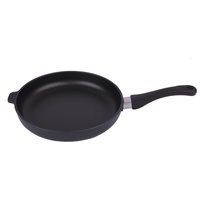 Eurolux has one of the first titanium micro ceramic reinforced non-stick surface. 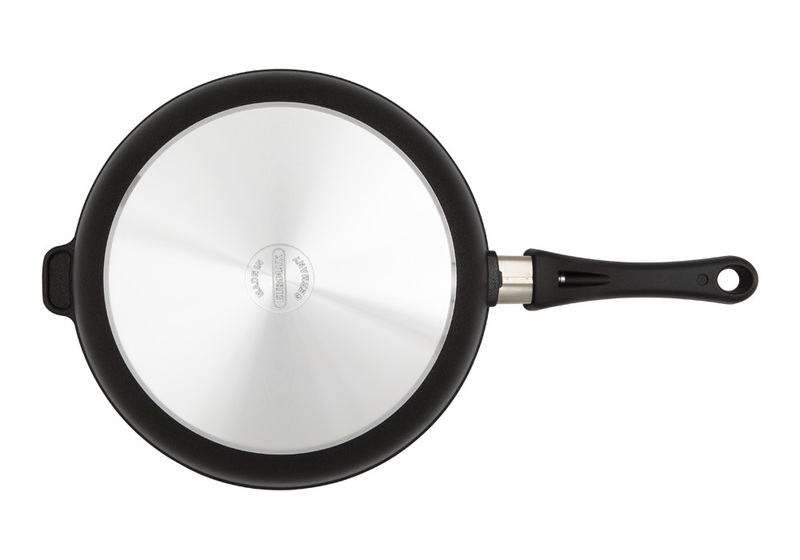 This surface is internationally exclusive to Eurolux cookware. 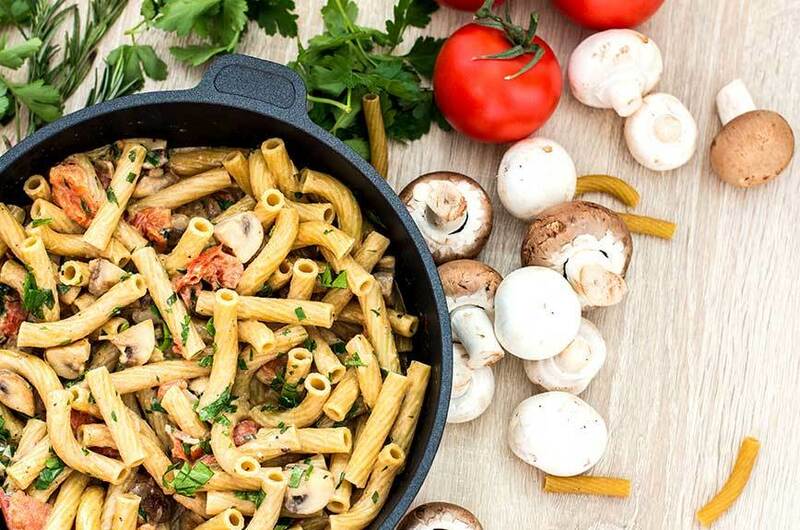 In a speciale heating process, all Eurolux products get sintered off at 435 Degrees C. This is done to ensure that the Products are food safe and no fumes are realeased while cooking on high temperature. The Bakelite handles are not only stylish in design but also offer great safety features. 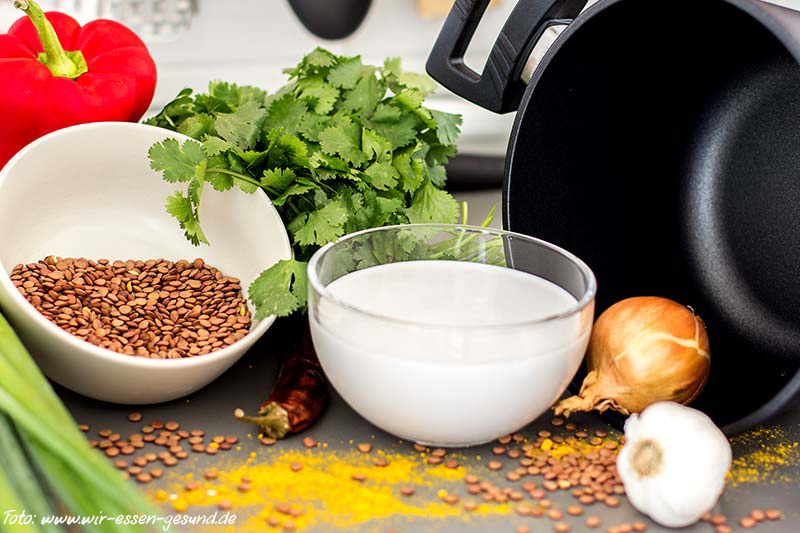 Eurolux induction cookware was developed in conjunction with major German Induction stove manufactures. 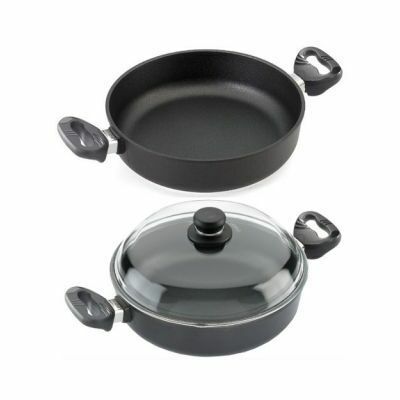 We have used the same Eurolux Cookware and plasma welded a magnetic steel base to the cookware. 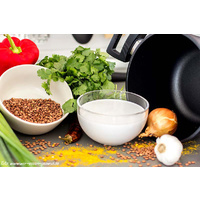 This will give you all the benefits of Eurolux non stick cookware, with the added advantage of being able to be used on induction tops without the anoying humming noise from a lot of other induction cookware. 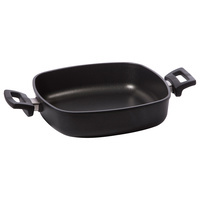 All Eurolux cookware bases are guaranteed for 25 years against any warping or distortion. 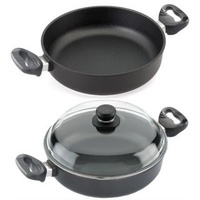 All Eurolux cookware products have a 3-year workmanship guarantee. 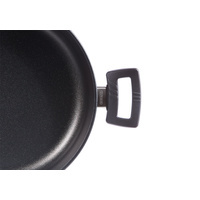 This guarantee covers any manufacturing or workmanship faults for cookware, including lid knobs, handles and glassware. 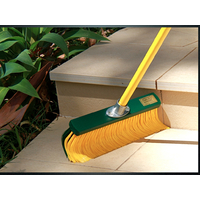 The guarantee does not cover faults due to accidental breakage or misuse. Faulty items will be replaced free of charge, after verification and assessment. Clean the cookware with hot water and a little dishwashing detergent, dry it thoroughly and oil it with a little cooking oil. The cookware is now ready to use. Always check for remains of dirt on the pan or pot base or on the ceramic-glass cooktop! Even the smallest salt or pepper grains can scratch the ceramic-glass cooktop as well as the cookware base when you're sliding the cookware back and forth. 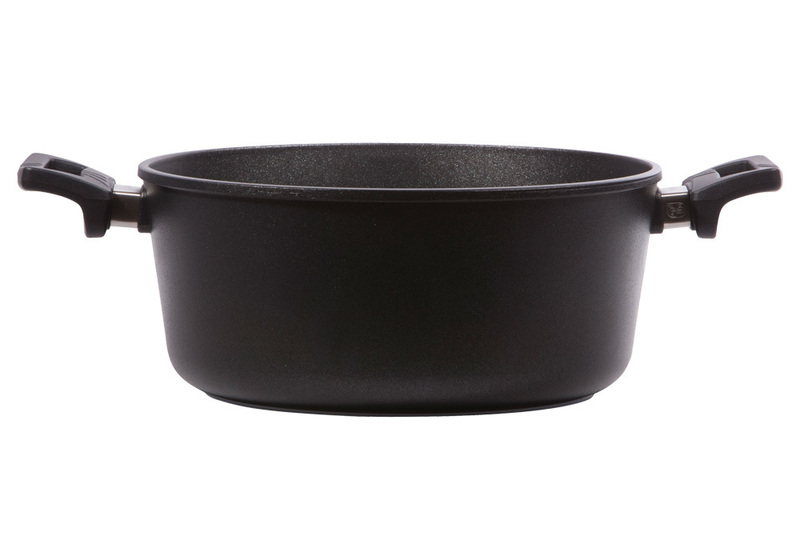 Lift your pan instead of sliding it, the handles are designed for this purpose. Add some oil or shortening to your pre-heated pan, then add the food for frying. Make sure to be careful of the frying temperature and avoid overheating. 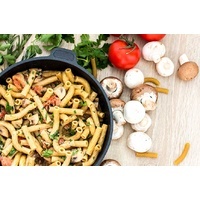 Burnt food and oils may become unhealthy and bitter in flavour. Please be aware that some oils should not be used for high temperature frying, as they are not heat stable enough. 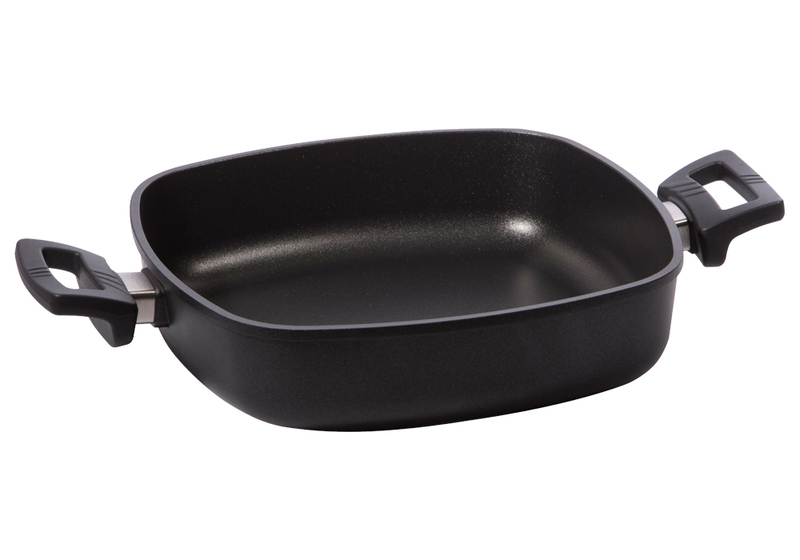 Ideal frying temperature is considered to be between 190-220°C. When using low temperature cooking oils such as butter, margarine and olive oil, be sure to maintain a lower cooking temperature. Please also, be aware that high-sugar marinades and vegetables such as red capsicum can burn very easily and are best fried with oil at a medium temperature. 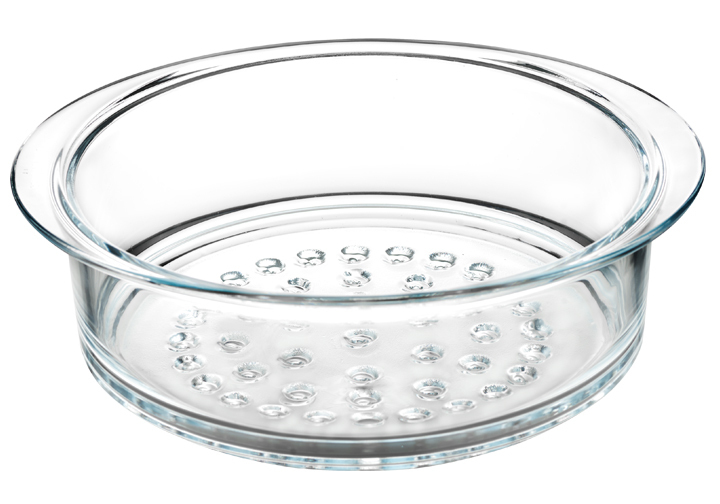 Use warm water, a little dishwashing detergent and a normal washing brush to clean the cookware. Make sure to wash off all residues, as these may build up over time and may reduce the non-stick properties. 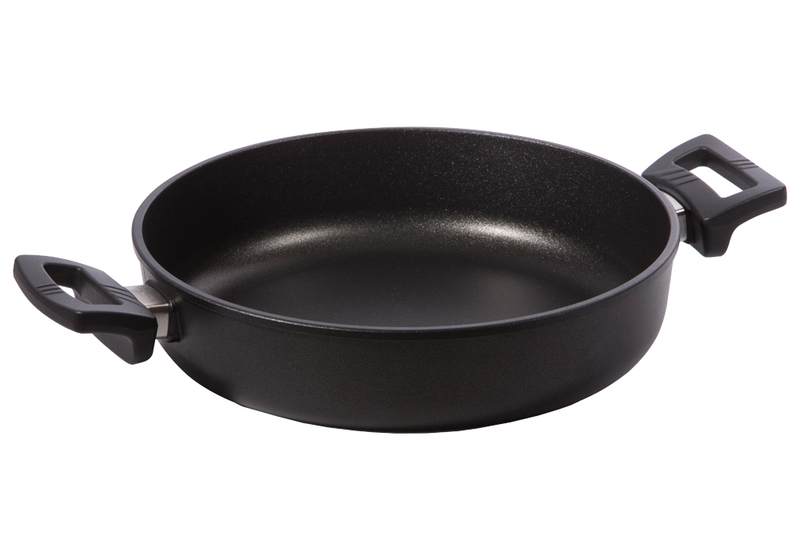 Do not leave food overnight in frying or baking cookware. Traces of use may become visible over time however, this will not affect the cooking characteristics. Ensure you prepare all ingredients before you start cooking to make the cooking process easier and faster. 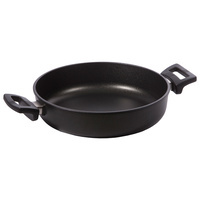 Do not overheat the oil in the cookware (if the oil begins to smoke it is already too hot), as this will destroy the oil and will create a bitter taste. Quick-fry meat, vegetables or seafood in a hot wok. Do not overload the wok. Overloading will drop the temperature in your wok and the meat will stew. To reduce or take the smell of seafood away from your hands, rub half a lemon into each hand and wash with cold water and soap. All recipes are guidelines only and may vary from time to time, depending on your ingredients, the portion-size of your food, the heat distribution from stove to pan or other non-controllable/variable circumstances. Marinate your meat for one to two hours with herbs or mustards before roasting to add great flavour. When roasting meat, keep your oven temperature below 190°C. This will cook the meat more evenly and ensure a nice, moist roasting—the roast won’t dry out. You will also find the oven less dirty due to no fat bursts or explosions, which happens when roasting above 190°C. A healthy life is a result of a natural balanced diet, containing the entire natural nutrients that are available in our daily foods. To maintain these nutrients, food should be treated so that its natural fluids and fats are preserved. Through steaming, vitamins, proteins, and mineral salts are kept in their natural form. Cooking with steam is the most effective way of preparing vegetables, fruit, fish or meat without salt - hence low on water and fat. When steaming, the use of salt is unnecessary as all foods keep its typical flavour (the amount of salt a person needs per day is less then 5 grams). Most foods contain sufficient salt. People with a high blood pressure, should go without salt. Better still, season with fresh herbs and spices. While steaming, the food is not directly in contact with the liquid but is gently cooked by the produced steam. 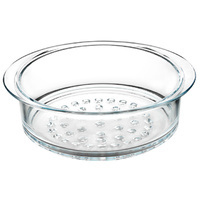 This causes natural fluids to rise with the steam into the top of the lid and drop back onto the food. Due to this circulation process the food is always cooked below the boiling point. The successful outcome of each dish is dependent upon the character of the recipe, the freshness of the food and the way it is prepared. This will maintain the valuable substances in fruit, vegetables, meat and fish, the consistency and colour, the vitamins and the natural taste. Nothing can better fulfil your desires than your new Steamer Set. Depending on the steaming time, vegetables will be "al dente" or tender. Meat and fish tender and juicy. The given steaming times are guidelines and can be varied to suit you personal tastes. Vitamins are essential for the metabolism and vitally necessary for the process within our body; but they have no nutritional value. These are the biocatalysts, but without them some chemical processes cannot occur in the cells. They are not synthesised by our body, but are effective in slight amounts. There is a difference between water-soluble vitamins, C, P, B, H, and the fat-soluble vitamins A, D, E, and K. Some of these vitamins, for instance A and C, are especially sensitive and are destroyed by heat, light or cooking salt. Meat and sausages, eggs and fish principally contain protein and vitamin B; covering 33% of our required protein from animal sources. Meat contains 20 to 30% invisible fat (saturated fat acids). The nutritional value of all meats is identical. Sausages contain less recommendable proteins as they include approximately 40% fat (saturated fat acids) compared to 20% protein. Fish contains approximately 20% protein, but on average only 3% fat; its calorie content is less than meat. Eggs are very rich as the egg yoke contains the vitamins A, D and E; the protein of the egg white possesses the best nutritional value. Also milk and cheese products possess a good nutritional value. They also contain vitamin A, D, E, and K and calcium in large quantities. Butter with 84% and cooking oil with approximately 100% are practically pure fat. They are necessary energy sources. Vegetable fat is healthier as it contains less harmful unsaturated fat acids. Grain products and potatoes offer the best proportions. They are rich in carbohydrates and vegetable protein. Peas and beans contain 23% protein and 60% carbohydrates. They are higher in protein than meat but their nutritional value is lower. Because of their husk they are not easy to digest. Fresh fruit and vegetables are rich in carbohydrates, liquid, vitamins and minerals. All in all they produce less energy calories but are rich in roughage. Vitamins, minerals and trace elements are essential for the human body. As our body does not produce them, we have to absorb them through our food. Various foods provide enough vitamins and minerals in different quantities. Water and Salt are necessary for our health. When just cooked in water, food is deprived of its goodness and the valuable elements are washed away. All vitamins are preserved when steaming without the addition of water and salt. The following overview explains which types of food contain the most important vitamins and their function in the body. Vitamin A: Liver, eel, margarine, milk and milk products, fruit and vegetables deliver the preliminary stage of vitamin A, the carotene. Vitamin A is a genuine beauty vitamin: It stimulates growth and renews the skin cells, protects skin and the moist internal surfaces of the body against dryness and damage, which would permit invasion by infections. Vitamin A is found in foods from animal sources only. It occurs in vegetables and fruit (mango) as Beta-Carotene. Beta-carotene is also called Provitamin A. It is transformed by the human organism into Vitamin A. Beta-carotene is only found in plants and prevents aggressive oxygen compounds in the body. Vitamin D: Milk, meat and meat products, eggs, fish, margarine and butter. Vitamin D is called the "sunshine vitamin" as it is formed in the body by the action of sunlight. It is found, for instance, in fish and is essential for the absorption of calcium and phosphorus for the formation of bones. It is also responsible for growth, development and preservation of healthy teeth, strong bones, tendons and ligaments. Vitamin E: Vegetable oil, margarine, butter, milk, cheese, grain products and vegetables. Vitamin E acts as the "police force" for the cells and is found in all vegetable oils. It protects the red blood cells and the sensitive fat acids in particular the unsaturated (those, for instance, that are important for the cell membranes) against attack from infection. Vitamin B1: Meat (in particular pork), offal, potatoes, grain products, milk and milk products. Vitamin B2: Milk and milk products, meat, grain products and potatoes. B Vitamins occur in natural products only as vitamin-complex. They assist with the metabolism-acceleration (Enzyme), new production of fresh skin, hair and nail cells. In addition, the function of muscles and the digestive system is dependent upon a sufficient supply of B Vitamins. B1 is the nerve vitamin (e.g. in bananas and wheat germs); B6 (e.g. in germs and walnuts) stimulates the protein development - good for muscles. It protects and strengthens the immune system and is the worst enemy of all illnesses. It stabilises the psyche in that it stimulates the production of hormones and nerve stimulation substances, over which our feelings are conveyed. In addition it strengthens the connective tissue. Calcium: Milk and milk products. Iron: Meat, meat products (in particular liver), grain products, fruit, fruit juice, vegetables and potatoes. The given amounts and steaming times are guidelines only. The times remain the same even when smaller amounts of food are used. The steaming time for the upper steamer insert is longer. Lay larger food pieces and food with a longer steaming time in the lower steamer insert. First cook food with longer steaming times and then add the upper steamer insert with food that requires a shorter steaming time. It is not necessary to defrost vegetables. Remove extra large stalks from broccoli, cauliflower and other types of cabbage. Use a shorter steaming time for greens to prevent them losing their colour. Put water or broth in the cast saucepan. When boiling, place the inserts containing the food on top. Artichokes Fresh, 4 whole ones average size 40-45 Min. Cauliflower Fresh, small heads App. 500 g 20-25 Min. Broccoli Fresh, small heads App. 500 g 15-20 Min. Mushrooms Fresh, whole App. 500 g 20-25 Min. Mushrooms Fresh, cut App. 500 g 15-20 Min. Fennel Fresh, in slices App. 500 g 15-20 Min. Green beans Fresh, whole or cut App. 500 g 25-35 Min. Carrots Fresh, in slices App. 500 g 20-25 Min. Potatoes Cut App. 500 g 20-25 Min. Potatoes In their skin App. 500 g 30-40 Min. Cabbage Fresh, cut App. 500 g 25-30 Min. Corn cob Fresh 2 cobs 55-60 Min. Leeks Fresh, cut App. 500 g 15-20 Min. Asparagus Fresh App. 500 g 30-40 Min. Courgette Fresh, in slices App. 500 g 15-20 Min. Apples Fresh, cut into 8 pieces App. 500 g 10-15 Min. Pears Fresh, cut into 6 pieces App. 500 g 10-15 Min. Tender and fine-fibrous meat is excellent for steaming. Always dry meat pieces before use. Create a broth according to your taste and bring to the boil. Place various herbs and vegetables into the steamer insert. Suitable for meat and poultry is: parsley, carrots, celery and fennel, which can later be served as a side dish. Frankfurter sausages Fresh 2-8 (skins pierced) 8-10 Min. Chicken pieces Fresh 2, each 150 g 25-30 Min. Veal escalope Fresh 2, each 150 g 30-35 Min. Lamb cutlet Fresh 2, each 120 g 25-30 Min. Turkey breast Fresh 2, each 150 g 25-30 Min. Beef sausages Fresh 2-8 (skins pierced) 8-13 Min. Dry the fish well. Create a broth according to your taste and bring to the boil. Place various herbs and vegetables into the steamer insert. Suitable for fish is: chives, chervil, and tarragon. You may even want to add some white wine. Trout Fresh 2, each 150 g 18-25 Min. Prawns Fresh 450 g 15-18 Min. Red fish Fresh 2, each 200 g 15-18 Min. Calamari Fresh 600 g 20-22 Min. Cray fish Whole 2 30-35 Min. Mussels Whole 1000 g 18-25 Min. Coral trout Fresh 2, each 140 g 15-18 Min. Tuna Fresh 2, each 200 g 25-30 Min. Bream Fresh 1, 400 g 17-25 Min. 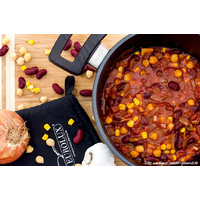 Tip: When steaming always fill cast pot with 1 - 1.5 litres of water and ensure there is always plenty of water in the pot during cooking. 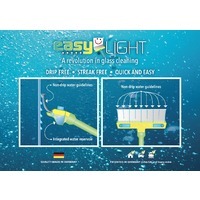 Help other Eurolux Australia Pty Ltd users shop smarter by writing reviews for products you have purchased.